Meet the Nash Sub Z Coolers. Fifty years of quality and experience. Looking for the best thermos? Check our best tumblers and thermoses from world known brands! The Nash manufacturer is world famous because of its products for using during summertime. This manufacturer has more than fifty years experience of creating highest-quality goods that has achieved a lot of positive reviews from users in many countries. It’s not a surprise that coolers made by this manufacturer are well known for their quality and high-end characteristics all over the world. 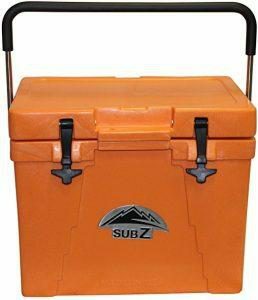 In this article we are going to tell you about the line of high-end coolers called Sub Z and manufactured by the Nash brand. These options will surprise you with the number of useful features implemented in each of them. In addition to the functionality and world known manufacturer you will be pleasantly surprised with the price of the Sub Z representatives, it is much lower than other similar options can offer you. Ready to start? (By the way in the bottom of this post you will find video review about Sub Z coolers for more information). 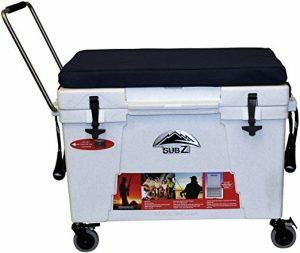 The line of Sub Z coolers will ideally fit people who prefer an active lifestyle and can’t imagine their life without camping, boating or kayaking. The main aim of manufacturers when creating these coolers was to make something very functional with high-end features and add the details for achieving the high convenience while using. We should note that manufacturers of these coolers were completely successful in it. As a result nowadays we are able to enjoy the high-end products that are extremely comfortable in using because of their each ideally thoughtful detail. 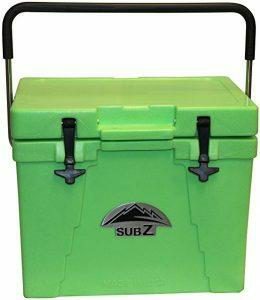 Each of the representatives of Sub Z coolers line is made with using the rotationally molding technology and can boast of the incredibly high durability and efficiency. The unique feature that stands these coolers from the crowd is their lid gasket. Thanks to the special Artic Dome technology the gasket provides you with the incredibly high level of sealing, which will not let the hot air into the cooler, thereby keeping its content in the cold during quite long time period. This type of sealing together with the 1.5 inches of special high-density foam that is used for the cooler’s walls insulation can offer the duration of ice retention that will be equal to the several days. The features, or rather accessories of the smaller and larger options are slightly different, so we will consider them separately. 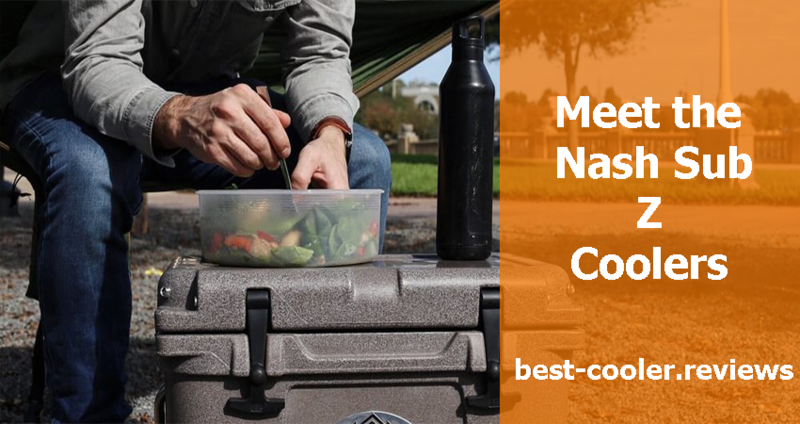 Larger options are equipped with build-in durable handles for the easy transportation even when your cooler is fulfilled. These handles also have the very convenient finger guards that make cooler’s carrying very convenient regardless of its weight. Also thanks to the wheels you can use the extendable handle for pulling the cooler if you don’t want to carry it by yourself for some reasons. 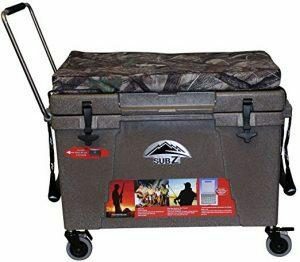 Beside wheels and convenient handles the large representatives of Sub Z coolers will provide you with the baskets, padded seat cushions and various boards for cutting. Speaking about small options from the Nash manufacturer they will provide you with the special anti-slippery feet that make it able to use them even on slippery or wet surfaces (good feature if use it for wet deck of the boat). Also you will have convenient and tough handle made of the stainless steel for simple transportation of the cooler. You are also able to choose the most appropriate color for you among such color available. For example you can choose the desired option in bright orange, green and blue colors or in the classic black or white colors. One more unique feature of all Sub Z coolers is the “V” shape of their drain channel. Together with the increased size of the plug for draining it allows draining melted ice quickly and without any significant efforts. The drain channel will separate melted ice from drinks and food in your cooler, saving them from soaking. The one more thing that will surprise you about Sub Z coolers is their weight. In comparison with other similar-sized options these coolers are thirty percent lighter that any of the similar options! And this is while being the same durable (and even much more durable in comparison with some options) as other models are. 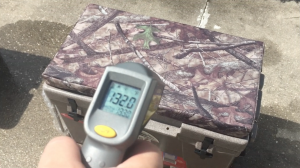 Also you will like the warranty during one years and the fact that all coolers from the Sub Z line are one hundred percent American made (all coolers are made in Texas, USA). 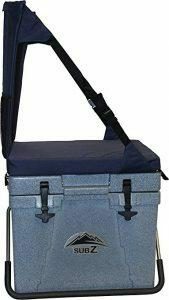 Probably the Sub Z line of coolers is not as popular as for example Pelican or Yeti coolers lines, but it still can provide you with very good duration of the ice retention period. The smaller option of the Sub Z line can hold an ice inside during up to six days of ice retention and are able to consist up to twenty cans together with ice. The larger options’ duration of the ice retention is also five days, but they can hold up to sixty five cans of your favorite beverages together with ten pounds of ice. 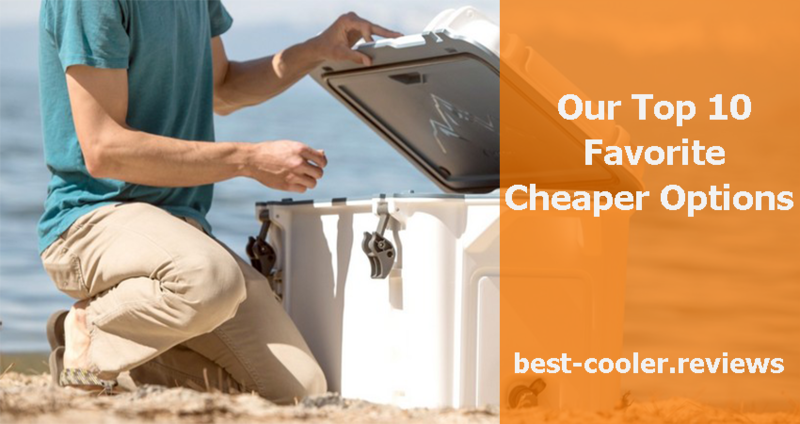 The price tag of these coolers is much lower than Pelican’s or Yeti’s because you don’t have to overpay for the brand name. If you are looking for the affordable options with good characteristics and long ice retention period- here they are. To make a short conclusion about all features of Sub Z coolers listed above we want to mention that these coolers are definitely worth your attention because of their comparably low price tag, good duration of the ice retention period and other high-end features. Also what we love about these coolers is their padded seat that can serve as an additional place for seating. 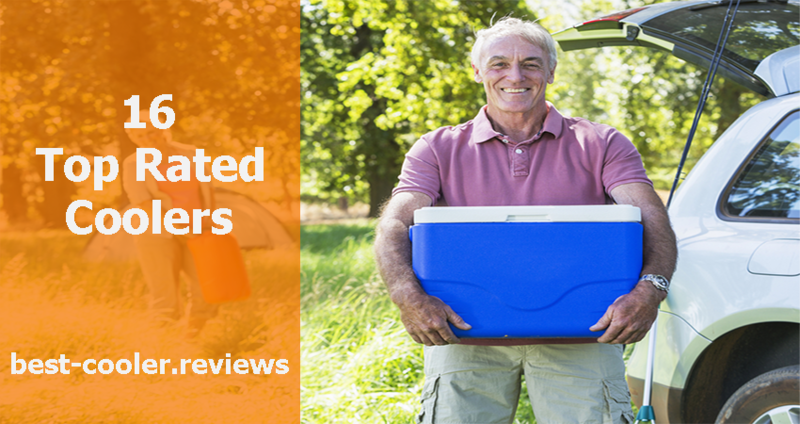 16 Top Rated Coolers – Which Is The Best Ice Chest?